The Center For Creative Leadership: Using 4MAT to Position "Design as a Strategic Advantage"
The Center for Creative Leadership (CCL) is a top-ranked, global provider of leadership education. The CCL faculty of over 550 offers leadership programs in the Americas, Europe, and Asia. CCL was looking for a "container" to hold and organize the 40+ years of experience of their vast faculty of over 1,100 global faculty and team members. Many of the faculty members of CCL have a background in the academic teaching environment and/or instructional design. 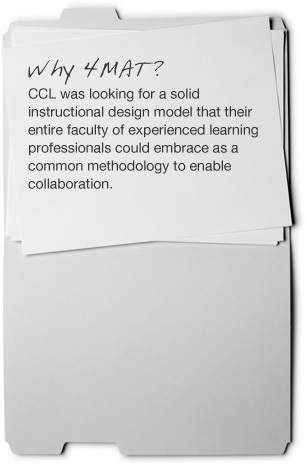 CCL was lacking an agreed-upon common design methodology that would enable efficient collaboration. To accelerate the design, testing, and delivery feedback process, CCL was looking for a way to standardize their approach to both public and custom course design. "With 4MAT, we could have substantive conversations about the [instructional design and delivery] work we shared." "As we trained our design and delivery faculty in 4MAT, one of the more senior faculty members shared with the whole class that this was the best internal training he had experienced in CCL and that what made it the best was that it provided us with a common language for talking about the designs we create. With 4MAT, we could have substantive conversations about the work we shared." "After an intense assessment of our offerings from a design perspective, we realized that we may have overplayed our strength in providing people with knowledge (Quadrant 2-Share) and that we needed to increase the amount of time we give participants to practice and apply the knowledge (Quadrant 3-Practice). 4MAT gave us a common language and frame for being equally adept at designing both the "know-how" and "how to" of leadership development. In fact, an epiphany that many of us have had with all of our experience, education, and training is that activity doesn't necessarily equal application. Unless your objective is to teach learners how to discuss or create dialogue, a 'talking, discussing activity' is not necessarily one that provides learners with adequate practice to develop the capability you're trying to develop." In addition to the public course offerings of CCL, the faculty consults with organizations to develop custom leadership development curriculum. The CCL team is one of the top 10 global providers of custom leadership education programs. One of the most common issues trainers share in 4MAT courses is the challenge of how to help clients (both internal and external) identify the right content to be included in a course design. More often than not, clients show up with clear opinions of what the training program should look like. The CCL team began to use the four key learning outcomes (described in Chapter 10) to guide the interaction with clients in the design process. This is where the opportunity to demonstrate value shows up and the concept of "design as strategic advantage" becomes apparent. To ensure consistency and facilitate skill development, the CCL design and delivery directors created a peer review process in which proposed custom designs by faculty are reviewed by peers through the lens of 4MAT. The common language of 4MAT enabled CCL to develop a shared database of designs. Each course is captured using the 4MAT framework, which enables designers to quickly review the design and understand what they are seeing. Learner satisfaction scores and overall client satisfaction improved immediately as a result of the enhancements to existing programs, particularly redesign of the Engage portion of courses. The CCL Global Faculty continues to build upon the 4MAT foundational skills learned. Newly hired faculty members participate in the 4MAT 4Business® Online Instructional Design Fundamentals Course to get "onboard" with the 4MAT model and become fluent in the "language" of design shared by the CCL team. The CCL 4MAT-certified trainers receive advanced training in courses such as "Leading the Training Needs Analysis Process" and "4MAT 4Delivery." The CCL 4MAT trainers provide advanced skill development for the CCL Global Faculty by delivering these courses globally. Begin with a critical mass of committed team members. A handful of committed team members can quickly animate the power of 4MAT. When enrolling team members in the value of 4MAT, focus on the idea that 4MAT provides a context for learning that enables a common language for learning design and delivery. When internal team members have differing and valid opinions on methodology, experience shows that most can easily find common ground in the simplicity and research-based credibility of the 4MAT model. Make a commitment that this is more than the "flavor of the month." New models, ideas, and strategies for improving learning impact come and go. To sustain 4MAT within your organization, select a core group of trainers to gain advanced teaching and coaching skills through 4MAT certification. Your in-house team can bring deeper and deeper layers of this model to your team, continually enhancing the skill level of the team.